760 S. Rochester Ave. Unit " C "
for scaling and polishing functions. No need for 2 individual units to perform each operation. 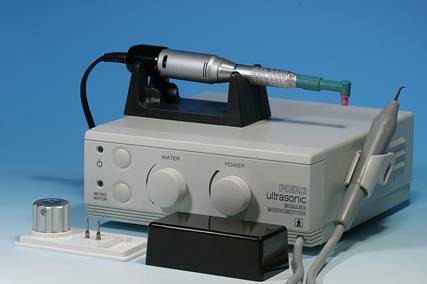 Piezo type scaler polisher combo unit is universally compatible with major piezo brand's straight hand piece attachment. Available in both the 115 & 230 VOLTS, which comes with 3 variety tips, 1 torque wrench, 1 detachable titanium hand piece with cable, 1 power cord, & 1 foot switch. Output powers ranges from 10 W to 35W with working frequency of 26KHZ-32KHZ. Allowable water supply of 25-60 PSIG (172-414KPa). Polisher speed is from 2,000 to 30,000 RPM. OPTIONAL ACCESSORIES ARE STRAIGHT HAND PIECE ATTACHMENT& PROPHY ANGLE (SNAP-ON OR SCREW ON). NOTE: PROPHY CUPS NOT AVAILABLE FOR SALE. UNIT IS FOR VETERINARY USE ONLY. NOTE: Accessories (straight hand piece attachment, & prophy angle) for this model is optional and not included with the unit. These accessories are sold separately at additional cost. All Rights Reserved © Copyrights M.D. McCauley Co., Inc. 2007. Site designed by CYMAK Canada Inc.